A receptor antagonist is a type of receptor ligand or drug that blocks or dampens agonist-mediated responses rather than provoking a biological response itself upon binding to a receptor. They are sometimes called blockers; examples include alpha blockers, beta blockers, and calcium channel blockers. In pharmacology, antagonists have affinity but no efficacy for their cognate receptors, and binding will disrupt the interaction and inhibit the function of an agonist or inverse agonist at receptors. Antagonists mediate their effects by binding to the active (orthosteric = right place) site or to allosteric (= other place) sites on receptors, or they may interact at unique binding sites not normally involved in the biological regulation of the receptor's activity. 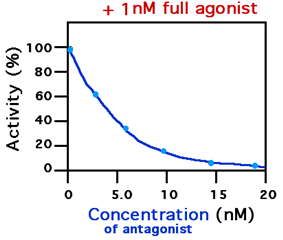 Antagonist activity may be reversible or irreversible depending on the longevity of the antagonist–receptor complex, which, in turn, depends on the nature of antagonist–receptor binding. The majority of drug antagonists achieve their potency by competing with endogenous ligands or substrates at structurally defined binding sites on receptors. ^ "Pharmacology Guide: In vitro pharmacology: concentration-response curves." GlaxoWellcome. Retrieved on December 6, 2007. ^ Hopkins AL, Groom CR; Groom (2002). "The druggable genome". Nature reviews. Drug discovery 1 (9): 727–30. ^ May LT, Avlani VA, Sexton PM, Christopoulos A; Avlani; Sexton; Christopoulos (2004). "Allosteric modulation of G protein-coupled receptors". Curr. Pharm. Des. 10 (17): 2003–13. ^ a b Christopoulos A (2002). "Allosteric binding sites on cell-surface receptors: novel targets for drug discovery". Nature reviews. Drug discovery 1 (3): 198–210. ^ Bleicher KH, Green LG, Martin RE, Rogers-Evans M; Green; Martin; Rogers-Evans (2004). "Ligand identification for G-protein-coupled receptors: a lead generation perspective". Curr Opin Chem Biol 8 (3): 287–96. ^ Rees S, Morrow D, Kenakin T; Morrow; Kenakin (2002). "GPCR drug discovery through the exploitation of allosteric drug binding sites". Recept. Channels 8 (5–6): 261–8. ^ Negus SS (2006). "Some implications of receptor theory for in vivo assessment of agonists, antagonists and inverse agonists". Biochem. Pharmacol. 71 (12): 1663–70. ^ Ariëns EJ (1954). "Affinity and intrinsic activity in the theory of competitive inhibition. I. Problems and theory". Archives internationales de pharmacodynamie et de thérapie 99 (1): 32–49. ^ a b c Stephenson RP (1997). "A modification of receptor theory. 1956". Br. J. Pharmacol. 120 (4 Suppl): 106–20; discussion 103–5. of the original article. ^ Vauquelin G, Van Liefde I; Van Liefde (2005). "G protein-coupled receptors: a count of 1001 conformations". Fundamental & clinical pharmacology 19 (1): 45–56. ^ a b Urban, J. D.; Clarke, W. P.; von Zastrow, M.; et al. (2007). "Functional selectivity and classical concepts of quantitative pharmacology". J. Pharmacol. Exp. Ther. 320 (1): 1–13. ^ a b c Lees P, Cunningham FM, Elliott J; Cunningham; Elliott (2004). "Principles of pharmacodynamics and their applications in veterinary pharmacology". J. Vet. Pharmacol. Ther. 27 (6): 397–414. ^ a b c Swinney DC (2004). "Biochemical mechanisms of drug action: what does it take for success?". Nature reviews. Drug discovery 3 (9): 801–8. ^ Wyllie DJ, Chen PE; Chen (2007). "Taking the time to study competitive antagonism". Br. J. Pharmacol. 150 (5): 541–51. ^ Colquhoun D (2007). "Why the Schild method is better than Schild realised". Trends Pharmacol Sci 28 (12): 608–14. ^ Schild HO (1975). "An ambiguity in receptor theory". Br. J. Pharmacol. 53 (2): 311. ^ Cheng Y, Prusoff WH; Prusoff (1973). "Relationship between the inhibition constant (K1) and the concentration of inhibitor, which causes 50 per cent inhibition (I50) of an enzymatic reaction". Biochem. Pharmacol. 22 (23): 3099–108. ^ a b c Vauquelin G, Van Liefde I, Birzbier BB, Vanderheyden PM; Van Liefde; Birzbier; Vanderheyden (2002). "New insights in insurmountable antagonism". Fundamental & clinical pharmacology 16 (4): 263–72. ^ Arend WP (1993). "Interleukin-1 receptor antagonist". Adv. Immunol. Advances in Immunology 54: 167–227. ^ a b c eds, David E. Golan, ed.-in-chief ; Armen H. Tashjian, Jr., deputy ed. ; Ehrin J. Armstrong, April W. Armstrong, associate (2008). Principles of pharmacology : the pathophysiologic basis of drug therapy (2nd ed.). Philadelphia, Pa., [etc. ]: Lippincott Williams & Wilkins. p. 25. ^ Surin A, Pshenichkin S, Grajkowska E, Surina E, Wroblewski JT; Pshenichkin; Grajkowska; Surina; Wroblewski (2007). "Cyclothiazide selectively inhibits mGluR1 receptors interacting with a common allosteric site for non-competitive antagonists". Neuropharmacology 52 (3): 744–54. ^ Lipton SA (2004). "Failures and successes of NMDA receptor antagonists: molecular basis for the use of open-channel blockers like memantine in the treatment of acute and chronic neurologic insults". NeuroRx : the journal of the American Society for Experimental NeuroTherapeutics 1 (1): 101–10. ^ Parsons CG, Stöffler A, Danysz W; Stöffler; Danysz (2007). "Memantine: a NMDA receptor antagonist that improves memory by restoration of homeostasis in the glutamatergic system — too little activation is bad, too much is even worse". Neuropharmacology 53 (6): 699–723. ^ Patil PN (2002). "Everhardus J. Ariëns (1918–2002): a tribute". Trends Pharmacol. Sci. 23 (7): 344–5. ^ Bosier B, Hermans E; Hermans (2007). "Versatility of GPCR recognition by drugs: from biological implications to therapeutic relevance". Trends Pharmacol. Sci. 28 (8): 438–46. ^ Pulvirenti L, Koob GF; Koob (2002). "Being partial to psychostimulant addiction therapy". Trends Pharmacol. Sci. 23 (4): 151–3. ^ Vadivelu N, Hines RL; Hines (2007). "Buprenorphine: a unique opioid with broad clinical applications". J Opioid Manag 3 (1): 49–58. ^ Greasley PJ, Clapham JC; Clapham (2006). "Inverse agonism or neutral antagonism at G-protein coupled receptors: a medicinal chemistry challenge worth pursuing?". Eur. J. Pharmacol. 553 (1–3): 1–9. ^ Kenakin T (2004). "Efficacy as a vector: the relative prevalence and paucity of inverse agonism". Mol. Pharmacol. 65 (1): 2–11. ^ Leurs R, Church MK, Taglialatela M; Church; Taglialatela (2002). "H1-antihistamines: inverse agonism, anti-inflammatory actions and cardiac effects". Clin Exp Allergy 32 (4): 489–98. ^ Frang H, Cockcroft V, Karskela T, Scheinin M, Marjamäki A; Cockcroft; Karskela; Scheinin; Marjamäki (2001). "Phenoxybenzamine binding reveals the helical orientation of the third transmembrane domain of adrenergic receptors". J. Biol. Chem. 276 (33): 31279–84.